Our basement is now dry and pleasant. My home was built in 1930, full basement, poured concrete foundation. I have a few spots that leak during heavy rain or significant snow melt, but not on a regular basis. There are a couple cracks that need repairing, and a couple of the leaks I can see are just cases of water wicking in through a poor seal between the pours. My mom's basement is taking on a little water .... I think it is from the front of the house and changed the downspout to correct but there is still a little water, and there may also be a little at the back. the basement recently had a sewer water problem, was cleared out by insurance and corrected but this is rainwater I think it has a history of water/flooding (?) when there is a lot of rain but my dad handled it in the past (has passed away) vacuuming up the excess ... not a lot of water, probably a couple of millilitres at most. She is in her 90s and may want to sell the house in a couple of years, so not looking for big redo, just something to make the basement dry. I have a roughly 8 x 8 section on my back patio I am looking to have levelled to install a hot tub on and am looking for quotes on what a job like this might cost. 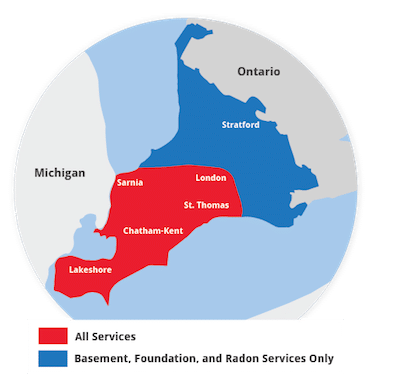 I would like radon testing in my home. Hi there. I had a quote from your company approx. 2 years ago. At the time, the quote was quite high. I have water that seeps in through the floor of my basement. I would like a French Drain system quoted along with costs to install a floor/remediate the walls. I would interested in potentially financing. Crawl Space- Musty smell comes through House. Older home would like a estimate. When you are in our area. Call in the evening or you can call during the day Work # Heather or Henry. I'm looking to have a proper sump pit/pump installed with a check-valve. My current 'system' was a do-it-yourself job that my ex did with leftover plumbing and an old recycling tub (you really have to see it to believe it). This is not a big job but would love a quote on it. I have a crack in my poured foundation in basement that needs repaired, and would like to get a quote. We not only adhere to the highest industry standards, we strive to be the industry leader in the home improvement related services we provide. We also use state-of-the-art products and technology which are designed to fix your home. We are the authorized Basement Systems dealer in Ridgetown, ON. I only have a partial basement. I would like to make it a full basement. Part of the basement needs reinforcing. The crawl space part foundation has settled and needs to be lifted.